I was pleasantly surprised to see this story run in Furniture Today about Raymour & Flanigan and their approach to taking on the bed in a box guys (BIB). I’m not here rooting for one or there other, but I am calling out a brick and mortar company for getting it right. There has been a lot of conversation about the BIB segment and questions as to whether it’s helping or hurting the industry. One thing is for sure, if you’re a brick and mortar retailer (B&M), without a digital strategy then it’s hurting you, but if you’re making an investment to learn your way in, and trying some new marketing messages along the way, you will be able to thrive during this shift in our business. (If you have not heard it you need to click on over to Sleep-Geek.com for the Dos Marcos podcast episode #71 where we talk to my buddy John Collins at OmniiX where he tells us about Amazon and how that should absolutely be a part of everybody’s digital strategy. Without a doubt one of my favorite episodes so check it out!) Based on my conversation with the good people at Raymour this campaign has been great for them. The retail sales associates really love it, consumers are reacting the way they are supposed to, and they are getting some good PR as well. 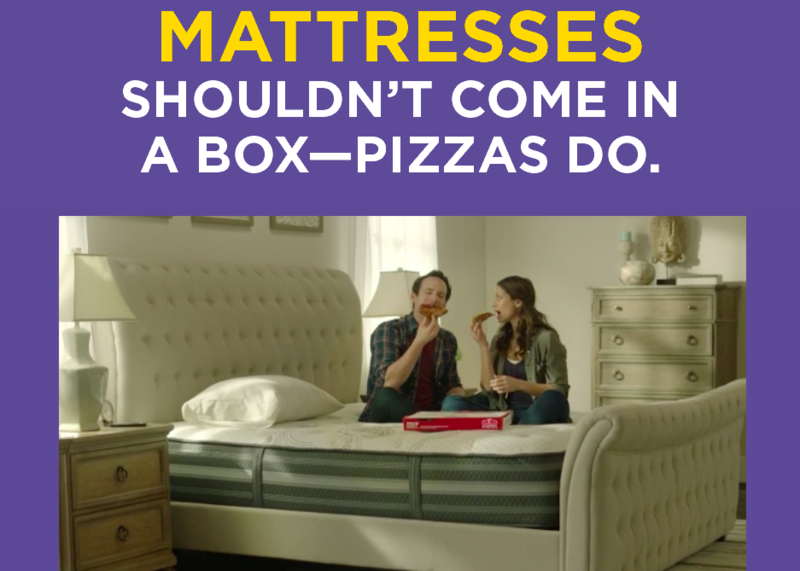 In my opinion, they got creative, a little cheeky, and offered up some great reasons to expect a better experience when you buy a mattress. Bravo, I love this stuff! If you are a brick a mortar retailer you really have a HUGE advantage don’t you? A place for the consumer to actually try your product. Yes some of the BIB guys are popping up stores but they have not been able to scale that idea yet and even when they do, I would argue that the B&M guys will have products that can not only compete but win that battle. There are more choices today than ever before and consumers like the idea of being able to pick from a list. There is certainly something to be said for the BIB guys making it simple stupid with fewer choices but even they are adding some choice. A mattress is still a blind purchase for consumers. You can certainly chat with someone online about your purchase but there is something really great about touching and feeling the demonstration units, being led through a fitting for the right bed, and trying each mattress out with the proper pillow which is a really big deal if you ask me. For many a BIB is going to be good enough for what the consumer is after but it’s that exact thing that gives the B&M guys the edge on the master suite. There are many people out there that may buy a guest bed or a kids bed from the internet, but doesn’t the luxury category belong to the B&M players? If you’re going to spend $2,500-$8,000 on a mattress aren’t you going to want to experience that in person? There is a significant difference in story and feel for the B&M guys that are carrying the right lines. If you have an incredible luxury mattress being presented in your department, you can definitely set yourself apart from anyone selling beds online. Getting those big ticket/high margin deals is very important these days wouldn’t you say? Spend money bringing in more people or sell more to the ones you already have. I don’t care what you say, there is no way you can deliver the same kind of customer service experience online compared to what you can do with the personal touch in the store. I’m NOT saying that BIB guys don’t take care of their customers because they do and the reviews support that. I’m saying that if you have the right people working your stores, it’s really hard to compete with a warm smile, firm handshake, and your ability to create a personal bond with that customer. Consider what Steven Stone, owner of Bedmart said recently in the Mattress Industry Executives thread posted by Brian Tippetts. Doesn’t this about sum it up? If you’re a B&M guy it’s time to step it up and earn that seat at the table. The commoditization of the mattress category has become worse with the foam blocks being dumped into the U.S. at crazy prices, and the BIB companies are kicking the crap out of almost every traditional mattress brand making themselves WAY MORE RELEVANT to the consumer with their marketing spend. So what do you do with that? Make sure you have some unique products the others don’t, and create an EXPERIENCE that nobody can compete with. Thanks Steve, you offer some sound advice! Next week to be fair, maybe I should talk about the advantages the e-commerce guys have over the B&M approach? What did I miss here, tell me in the comments section! Good read, thanks – Mark. I believe B&M can all experience success if they offer a great overall experience, including great product and excellent service. And lets not forget, a winning local digital marketing game. For example, for the retailer, local SEO & securing a Google review through a strong post-sale strategy is vital since consumerism is so opinionated these days. Many retailers lack this, and BIB is taking advantage of it. 92% of consumers searching read reviews for local business, and 40% of consumers form opinions by reading just 1-3 reviews. No doubt Carlos, I agree. They need to have a strong digital presence on top of the in-store experience. It all has to work together. Thanks for reading!